Mission City sits on the north bank of the Fraser and is home to approximately 40,000 people. It is a beautiful little city that is known as “The Jewel in the Valley” with its scenic lakes and view of the mountains. It is also rich with history. Mission is the site of Canada’s first train robbery and home to the oldest known First Nations’ archaeological site in British Columbia. Mission has a climate like any other part of the Lower Mainland. Meaning it rains for almost 1/3rd of the year. With this weather, comes the need for our Mission Roof Cleaning & Moss Removal Service and roof maintenance program. These are essential for any home or business. You’ll see our Gorilla technicians on rooftops, busy with Mission Roof Cleaning & Moss Removal, from early Spring right through to late Fall. We usually perform our Mission Roof Cleaning & Moss Removal Service at the same time as Gutter Cleaning. When paired, only a once a year visit is required. Almost 50% of the homes in Mission will have rooftop moss growth. Typically, with heavily shaded or north-facing areas of the roof, there will be some type of moss growth that needs attention. 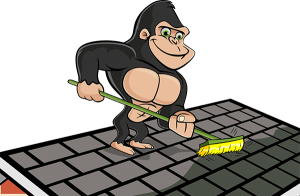 The Gorilla technicians in Mission want to protect the longevity of your roof. Therefore, care and detail are taken into great consideration when performing our Mission Moss Removal Service. We will NOT pressure wash the roof. This takes off layers of protective coating from your roof’s first line of defence against everything Mother Nature has to throw at it. Our Gorillas in Mission City are looking forward to hearing from you this season about your Moss Removal needs. Feel free to give us a call regarding your Mission roof cleaning and Moss Removal. Should you spot a Gorilla onsite, our friendly knowledgeable technicians will be happy to answer any questions you have.